Our Borderlands Coffee Project in Nariño, Colombia, includes a research partnership with our friends at CIAT, the International Center for Tropical Agriculture in Cali, Colombia. The collaboration allows us to use the project as a platform for field research, generate results-based evidence, and support decision-making at multiple levels: on the farm, in the policymaking process and in the coffee industry. So far, it has been delivering the goods. CIAT’s researchers helped us develop and implement a heavy-duty baseline survey that generated vital insights about Nariño’s coffee sector. They facilitated a multi-stakeholder process in Nariño that used those insights to develop a new official strategy for the sector. They helped us design the Colombia Sensory Trial and led the quantitative analysis of its results. And they mined the data we collected in the field to identify three different types of coffee growers, each with different production costs, different levels of productivity and different levels of income. This month, the collaboration has achieved an important milestone: the first time a peer-reviewed journal has accepted research based on data collected by the Borderlands project. 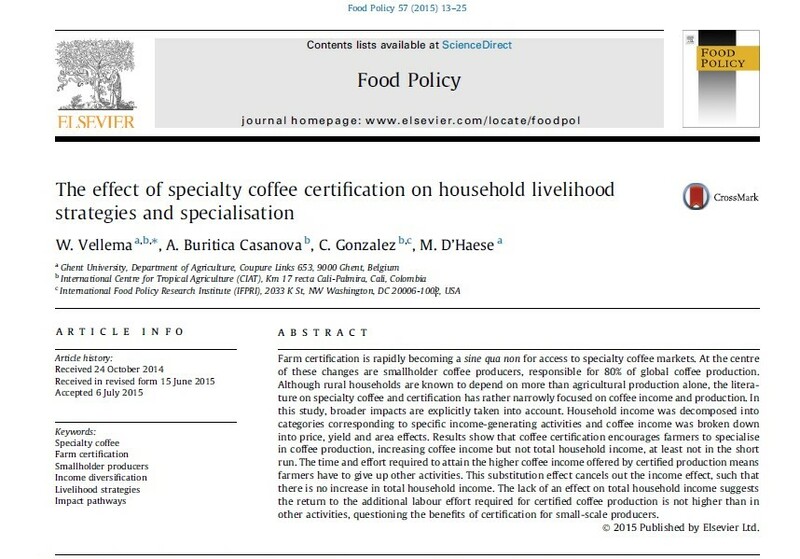 “The effect of specialty coffee certification on household livelihood strategies and specialization” was published in the November 2015 issue of the journal Food Policy. It was based on data collected through the Borderlands baseline survey in 2012. The article was written by Wytse Wellema, a Ph.D. candidate at Ghent University, along with two CIAT economists and a researcher from the International Food Policy Research Institute. It explores the relationship between coffee certifications (both voluntary sustainability standards like Rainforest Alliance certification and corporate sourcing standards like Starbucks’ C.A.F.E. Practices and Nespresso’s AAA Sustainable Quality) and the decision of farmers to specialize in coffee, and then examines the impact of that decision on a range of variables including income, land-use patterns and the allocation of resources at the household level, including time, labor and income. strategies focused narrowly on coffee specialization and coffee income are not likely on their own to foster sustainable growth in rural economies. I will explore this article’s contents and implications further over the next two days, first in an interview with the lead author tomorrow and then in a reflection on the study’s findings on wage labor Thursday. It’s always interesting reading about these things. Thanks for the information.